Grand forests, mighty canyons and pristine beaches are all worthy causes to visit a place, but sometimes the best natural attraction a destination has to offer is skyward. From night skies speckled with stars to the awe of the Northern Lights, these seven hotels are designed for astronomy buffs. They offer unobstructed views of the heavens, onsite observatories and some even have rooms with retractable or glass ceilings for stargazing from the comfort of your hotel bed. At the Hotel Ranga in south Iceland you’ll find a resort that goes out of its way to cater to astronomy buffs. Along with its 51 rooms, the log cabin-style hotel also has an onsite astronomical observatory with a retractable roof and two high-tech computerized telescopes. It’s touted as the most advanced observatory in Iceland. The hotel also has three outdoor hot tubs that are fed by geothermal water. September through April they make great spots for catching the Northern Lights. Elqui Domos; calls itself the only astronomic hotel in the Southern Hemisphere—and with their rooms designed around star gazing, it’s a title well earned. More than 350 miles from Santiago, the hotel is nestled away in the Elqui Valley. Their geodesic rooms and observation cabins offer everything you could want from an accommodation, including living rooms and bathrooms. The real appeal, however, is their astronomical features, which include tent ceilings that open to the night sky and cabin skylights above the bed. The hotel also offers astronomy tours and nighttime horse rides under the stars. Ten of the 22 rooms at Portugal’s L’AND Vineyards resort are Sky Suites, with retractable ceilings above the beds that allow you to literally sleep under the stars. The rooms are simple and feature minimalist stone and wood accents that complement but don’t compete with the sky views. The resort is located in Alentejo, which claims to have some of the least light pollution in Europe. Along with the in-room plunge pools, there is also a large outdoor pool for swimming under the unadulterated night sky. From 3100 Kulmhotel Gornergrat you can see the Monte Rosa Massif, Gorner Glacier and 29 mountains with peaks over 13,000 feet, including Switzerland’s Matterhorn. Yet the real appeal of this hotel is its world-class views of the night sky. There’s an astronomical observatory on the property, but you won’t even need it. Perched on the Gornergrat ridge in the Pennine Alps at more than 10,000 feet above sea level, the hotel promises views of the Milky Way and various planets with no more than your naked eye. 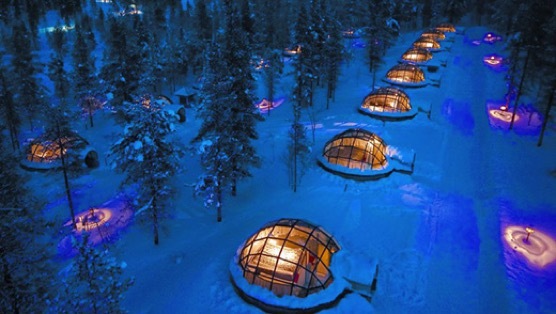 The glass igloos at Finland’s Kakslauttanen Arctic Resort offer the perfect accommodation for avid star gazers. Better yet, the hotel’s Lapland location gives you the chance to witness the Northern Lights without having to venture out into the cold. The best time to book an igloo is the middle of August through the end of April, when the sky is likely to be painted in shades of blue and green. With its onsite observatory dome that’s home to a Celestron CGE Pro 1400 series telescope, Primland claims to offer some of the best stargazing on the United States’ East Coast. From the dome, attached to the top of the hotel’s turret, you can catch “extraordinary glimpses of the heavens and of objects well beyond our solar system.” The hotel also offers presentations for guests with resident astronomers, as well as a smaller telescope that can be used for viewing the stars from the terrace. Primland is tucked away on 12,000 acres in the Blue Ridge Mountains, where the remoteness and altitude only add to the views, both on the ground and upward. Tucked away in Italy’s Brenta Dolomites is the Carlo Magno Hotel Spa Resort. While many people visit for access to the ski lifts and snowy slopes of Madonna di Campiglio, the hotel’s astronomical observatory has been attracting its fair share of guests as well. The hotel offers guided evening sessions with their telescope and invites avid astronomers to even bring their own equipment. If you’re thinking of visiting, consider September, when the hotel hosts an astronomy week featuring presentations from Italy’s top astronomers.